Welcome, and thank you for visiting us on-line at Victor Elementary School, home of the Bears! 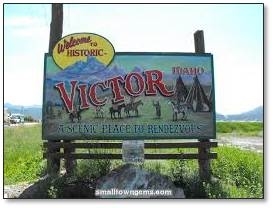 Victor Elementary School serves students in the Victor area of Teton Valley, Idaho, with grades K-3. Victor Elementary has a new cell number with texting. Text 208-399-2361 to excuse your child from school, change of plans, etc. With our answer machine not working this should help in getting your messages to us when we are not in the office. Thank You! February 12 - The Victor area early bus has started again. This is for students that live around Victor outside the walking area that are presently riding a late bus or being picked up. The areas not included are West 8000 South and South 4500 West, South of Highway 31 from South 500 West and West 9000 South. If you have questions, please call the bus garage 208-228-5811 or the school. PLEASE WATCH FOR INFORMATION ON YOU CHILD'S CLASS FIELD TRIP. the classroom will be provided by the school. Your child will only need to bring a back pack. Optional donations of tissues, snack size or sandwich size reclosable bags, crackers or similar item. name). Mrs. Street's class also needs a pencil box. Please call with your questions, suggestions and concerns. Anonymous Tip Form: to submit any anonymous information about any safety concern, click here. provide specialty classes of music, physical education and art."